Every other month, WLA, along with its exclusive Membership/Mentorship Sponsor, Dowd Bennett LLP, hosts group luncheons open to either law students only or WLA members who are 36 and under or have been practicing 5 years or less. These luncheons feature prominent members of the judiciary and/or leaders within the legal community. Since space is limited, each attendee is given a unique opportunity to learn from and network with judges, lawyers and community leaders in a small group setting. For more information, please contact Sheena Hamilton. 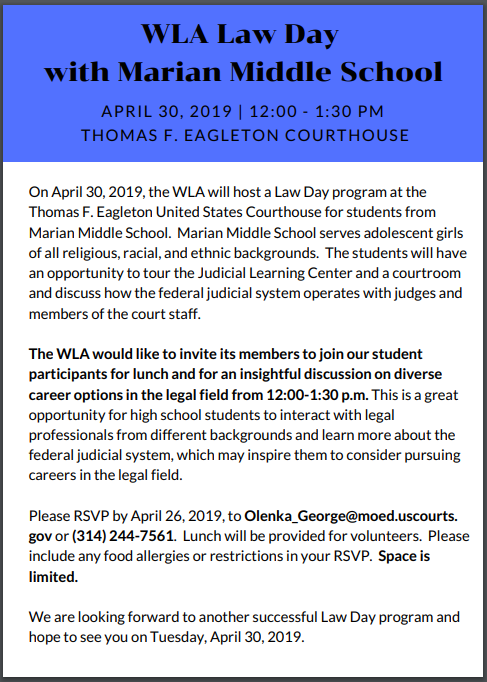 March 2019 | Honorable Mary Kathryn Hoff, of the Missouri Court of Appeals, and Elizabeth Carver of Dowd Bennett LLP. | Register here. September 2018 | Jennifer A Haynes, Assistant General Counsel & Vice President for the Federal Reserve Bank of St. Louis and Jennifer S. Kingston of Dowd Bennett, LLP. April 2018 | Honorable Annette Llewellyn, Circuit Court Judge for the 22nd District. and Christina Moore, Associate General Counsel Saint Louis University. March 2018 | Honorable Susan E. Block of Paule, Camazine & Blumenthal, P.C. and WLA Past President Jessica Kennedy of Washington University. December 2017 | Hon. Nannette Baker (United States District Court for the Eastern District of Missouri) and Beth Boggs (Boggs, Avellino, Lach and Boggs, LLC). July 2017 | Dana Tippin Culter (Attorney at James W. Tippin & Associates and the Missouri Bar Association President) and Nicole Colbert-Botchway (Associate Circuit Judge St. Louis City and Past President of the WLA). March 2017 | Kristol Whatley Simms (Corporate Counsel at Ameren Corporation and ACC President) and Christina Lewis Abate (Director of Underwriting at the Bar Plan).